Because a Christian’s overall purpose is to glorify God, I as a Christian should want to give to advance his kingdom throughout the world. A faith promise for missions is an expression of my obedience to Christ’s command to “make disciples of all people.” Committing to a faith promise gives me a new perspective on my assets and priorities. I begin to see that everything I have belongs to God. I look for ways he provides, so I can give more for his cause. When I commit to give in faith, I do not rely on my limited resources, but on God’s UNLIMITED resources. Read more about it by clicking the brochure image. In this video, Keith Brown (OC missionary to Asia since 1958) explains the concept of "faith promise" giving and how churches around the U.S. use this principle in missions giving. 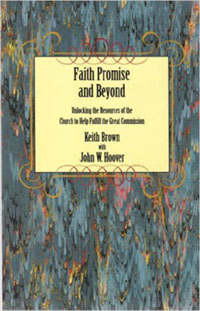 This book is by Keith Brown with John W. Hoover. It is invaluable in understanding and conducting a Faith Promise weekend. It gives an excellent explanation of "faith promise" and ways to present it to your congregation.